Muddle, mix, shake, stir, pour–whatever the method, you’ll learn how to create the perfect cocktail. Whether you’re new to mixing drinks or have been creating your own cocktails for years, The Craft Cocktail Compendium has everything you need to know to mix, shake, or stir your way to a delicious drink. 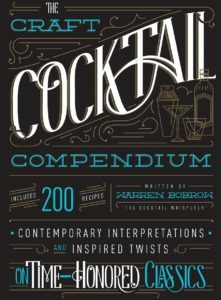 With over 200 craft cocktail recipes, expert mixologist Warren Bobrow will help you broaden your skills and excite your taste buds with unique takes on timeless favorites and recipes you’ve likely never tried before.